After ranting previously about the horrors of ‘Awareness Movies‘ I then presented, with the example of DS9, how popular entertainment and science fiction allegory is much more effective at dealing with the subject of International Relations and politics than all the pearl clutching of Meryl Streep, Robert Redford, and NPR reviewed movies combined. It is a theme I would like to explore further. I know that previously I suggested that the next time I would delve into great fictional settings which overlapped with international relations I mentioned Battletech would be the next post on this topic. That is not to be so. Battletech is a setting which I have loved since I was a kid, and it is a great example of the theory of offensive realism and balance of power in action. However, it, like the previously covered universe of Star Trek Deep Space 9, is a great-power focused setting. Having done that last time, I feel that something else is in order. After all, most nations today on Earth are not great powers, and it is intra-state conflicts such as civil wars which are the most typical forms of strife in our present era. Additionally, many nations around today are the products of colonialism and are still dealing with the aftermath of that. Many are divided into hostile factions because of this, even if the factions share hatred of common foes from the past. Now let me introduce you to the world of Heavy Gear, one in which all of the above descriptors of conflict in our world strongly apply. 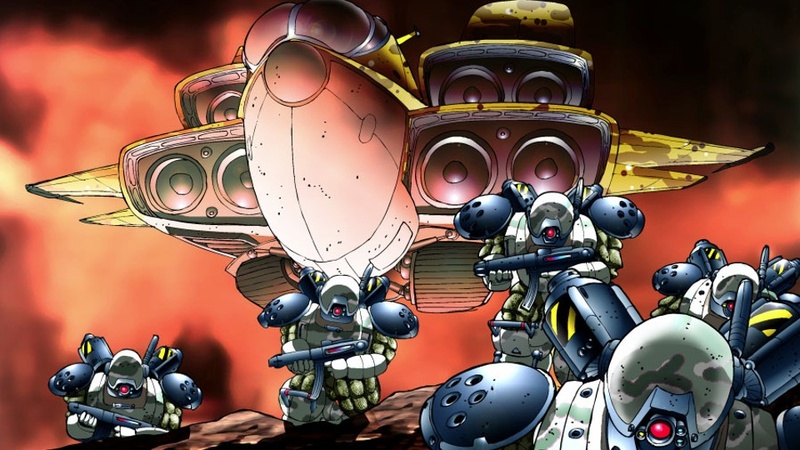 Heavy Gear, a product of Dream Pod 9, began as a tactical tabletop board game in the 90s. It reached its peak fame with two games released at the tail end of the mech based land simulator craze in the late 90s. Heavy Gear I and II were games which I found by far the most fun (if challenging) to play as a kid in this genre, and the second one in particular became my favorite land combat simulator of all time. It still is. Though getting it to run on any computer system from any time period after Gary Condit’s congressional career is notoriously difficult. In fact, I was only recently reminded of its existence full-force after a long time of neglect due to finding out about the upcoming Heavy Gear Assault, which reminded me of my love for this often under-the-radar series. In addition to the fluid and unique control scheme, the setting offered a lot of new stuff to a then-over-saturated genre. 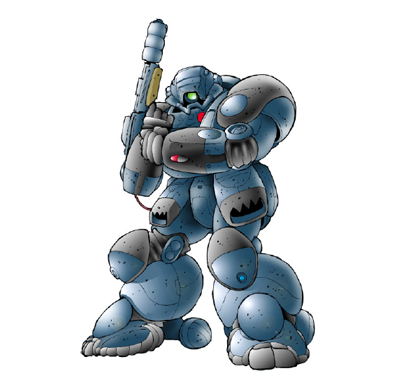 Gears were small (about three humans high on average), using maneuverability and tactics along with the flexibility of going prone, crouching, and launching mortars from their backs to bombard enemies from ambush. They had a kind of ‘stealth-mode’ in the form of passive sensors (vs active ones) and in the second game you could customize camouflage patterns-though this had no real effect on the game, it was still a cool touch. Gears effectively functioned as elite warriors and special forces, but were by no means the sole core of military forces. Many large tanks in a stand-up fight were more powerful than gears, and hover vehicles, APCs, infantry, and even floating hover-battleships all worked together in combined-arms fashion. Given that Gears had the most interesting missions and versatility (not to mention skates for moving over flat land fast), that was what you played as in the games. And it was a blast. It also made sense. Sure, anthropoid combat vehicles make little sense in an era of heavy firepower with those high target profiles, but the gear felt much more feasible if less awe-inspiring than the conventional mechs of other series’ when it came to imagining future warfare. But what really interests us right now is the setting. Heavy Gear does not traipse across the galaxy chronicling the rise and fall of massive star empires. Its setting, in fact, is a single planet. Terra Nova, once the jewel in the crown of Earth’s expansionist empire, now a world divided into two hostile geopolitical alliance networks made up of multiple nations. With its focus on a single world, the Heavy Gear setting allows geography to matter once more. Strange anomalies in magnetism enable massive floating battleships and carriers to act as navies on a world where most water is underground. Most of the population is clustered near the more temperate poles of this warm planet while the equator is a desert band with few people but much in the way of resources. It is this that forms the rough border (and primary disputed territory) of the Northern and Southern leagues (more on this later). Once Earth’s empire went into decline, its outlying colonies were abandoned. Cut off from support of the mother world, Terra Nova had to effectively start from scratch. The chaos of sudden and rapid decolonization coupled with that the planet was largely just exploited for resources under Earth meant that it did not have the requisite stability or infrastructure to thrive in the short term. Needless to say, this is a familiar story for many parts of our own world in the mid-20th century. Eventually, after much strife, coalitions were built around the poles. In the North, a common religion and political ethos facilitated an almost-equitable confederation, The Confederated Northern City-States. In the south, the rise of one particularly successful and powerful state, The Southern Republic, gave rise to a more autocratic system of alliances, where said republic dominates the other nations as vassals and proxies through the Allied Southern Territories alliance network. The setting, being well developed however, does not make the north the good guys and the south the bad guys. The more one looks, the more complicated the situation becomes. The North may be a more political success, but it is heavily influenced by a somewhat militarist and very morally strident religion and society priorities some fields much higher than others to its cultural detriment. The South is less unified, but its dominant state is a culturally dynamic place where people have many (non-political) freedoms that those in the north lack. Just as in most conflict zones today, it is impossible to declare a ‘good’ and ‘bad’ faction as an absolute, and rather your feelings as an outsider will be guided by your personal preferences. Certainly, neither side could be easily glorified. Even if my personal loyalties are always going to reside with the faction which deploys the excellent Black Mamba gear. Especially the sweet Snake Eyes Mamba variant! Between these powers, many smaller nations still continue to eke out a dangerous and fragile existence. Some, like the officially neutral autonomous arms manufacturer, Peace River, successfully exploit these niches to make lots of money off of perpetual frontier warfare between the northern and southern leagues, others find themselves courted or fought over by the larger powers. From South Asian partition to the more recent splitting of Sudan and South Sudan, to the division of Korea, we in the real world are very familiar with such narratives. In many more cases we are also familiar with officially unitary states which are anything but in practice, much like the Democratic Republic of Congo. Largely, on matters dealing with space in the future, it seems there is little focus on planets having multiple hostile political entities-but on Terra Nova this is a reality. I see no reason, in a hypothetical future of human expansion off-planet, that this would not be the case. It is certainly in line with human history. Division and unity come in cycles, not linear narratives with clear ending points. But what is most interesting about Terra Nova is that multiple conflicts over the Badlands have not dampened the general sense of Terra Novan solidarity when it comes to the old colonial master of Earth. When a resurgent Earth attempted to reconquer its old abandoned colonies centuries after it gave them up, it used its superior wealth and technology to take a few of them. But Terra Nova was a different story. The defiant planet unified against the invaders. And using the Gears they had invented (originally for mining) as re-purposed war machines, they defeated the ‘Earthers’ and drove them from the world, leaving only a small cut off remnant behind, which quite fittingly is named Port Arthur. This is the element of this fictional setting which I think has the potential to be the most interesting when pondering our real world future. In an era of rising multipolarity and where we can quite clearly see neocolonialist policies from some countries such as France in West Africa or Russia towards some of its neighbors, to name just a few, will we ever see collective bloc alliances among normal local foes on other as a reaction to bigger more global ones? This will depend of course on the behavior of more powerful countries towards less powerful ones, but it is interesting to think about. The widely divergent Non-Aligned League of the Cold War, though not much of a real actor, is an interesting example of an attempt from the past. Pictures used are from Dream Pod 9.